All prices include: 1 Confined & 1 Open Water Dive, Dive Instructor (Group size up to 2 Person), Scuba Gear, Boat, Lunch, Water, Tea & Coffee. If you like to make 1 additional Open Water Dive during this trip please check here. 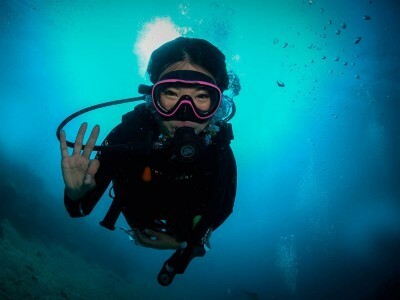 We would be happy to welcome you here at our Divecenter for your diving adventure. We are offering 2 or 3 Discover Scuba Dives during a full day trip. The trip starts at 8 am in the morning and we will have 2 morning dives at different divespots. Afterwards we will have our Lunch before we can proceed to our 3rd divespot in the afternoon. We will be back in Romblon Town around 3 pm. If you like to do only 2 dives you are welcome to use the time to snorkel around or just relaxe on the Boat. Above you can find our Online Booking Calendar for “NOT Certified Divers”. You can see directly the availabilities and you can book your Scuba Diving vacation in Romblon instantly with Romblon Fun Divers & Inn. All will be prepared for you and no rush or hurry during your arrival.